Previous LetterWho does she think she is? The way I look at it, a work of art requires the presence of two spirits. The first is the spirit of the subject matter — the object or thing that the work is based on — Nature’s spirit. The second is the spirit or interpretation the artist brings to the object — the unique style or manner that only the individual artist can give. Subject matter alone — the slavish copying of nature — does not make art. But art also falls short, in my opinion, when it doesn’t lean to some degree on the stimuli of place or subject. 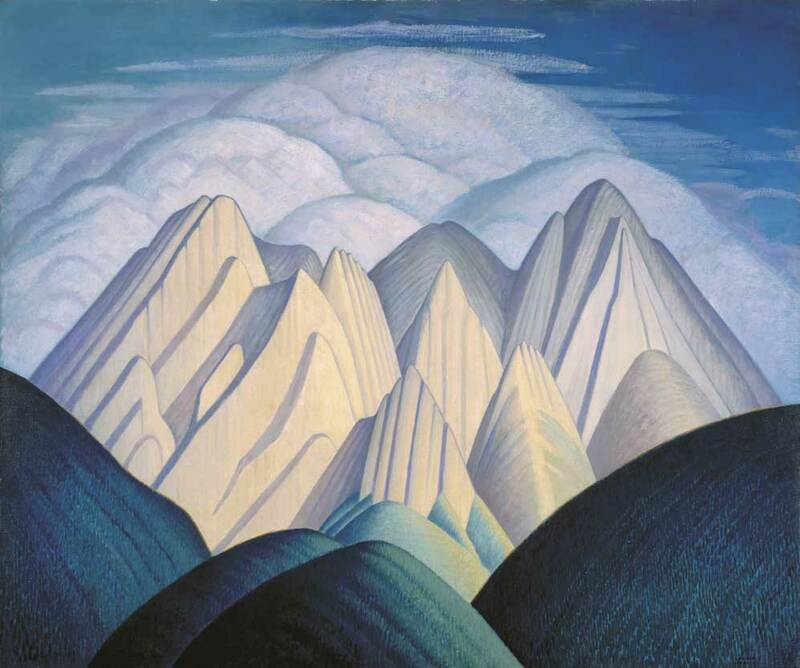 Up here in the mountains I’m realizing that the dual spirit methodology is no better exemplified than in the work of Lawren Harris (1885-1970). 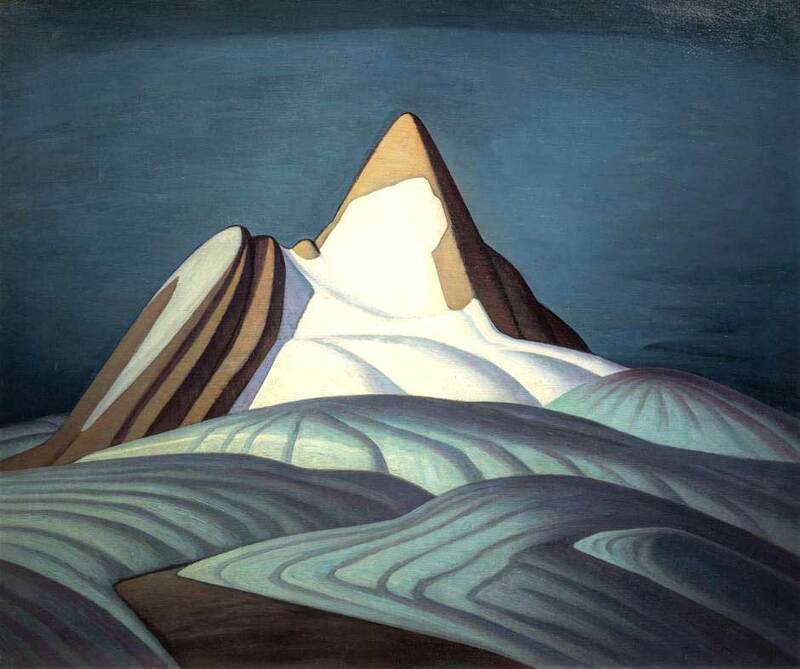 He was a founding member of Canada’s Group of Seven and a life-long student of art and the world of self-discovery. By the time he came west to the Rockies he was into spiritualism and drifting toward Theosophy. 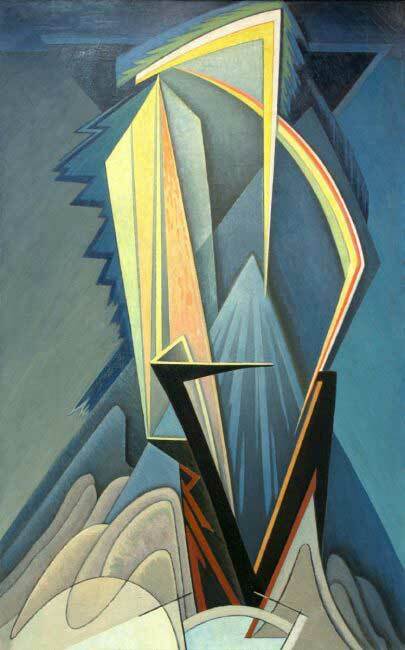 Influenced by the Nordic school, art deco and symbolism, Harris’s mountain paintings honour and monumentalize his feelings about Nature. Dual spirit requires that the artist see and feel the environment. In Harris’s case, his location pencil sketches began to redesign and simplify basic elements and forms. Back in the studio there was to be another step in his creative process: His paintings developed in a realistic manner, but were often quite unlike any particular view that might be seen in the outdoors. Attempts to find some of Harris’s actual mountain locations have been futile, and so they should be. Art is not what is seen, but what is to be seen. For Harris, abstraction was just around the corner. Indeed, during the last ten years of his life when I knew him, he struggled daily with shapes and designs that bore no resemblance to reality. But they were enigmatic of the spirit he felt for wind, tumult, energy, elevation, placidity and his lifelong concern, spiritual awakening. 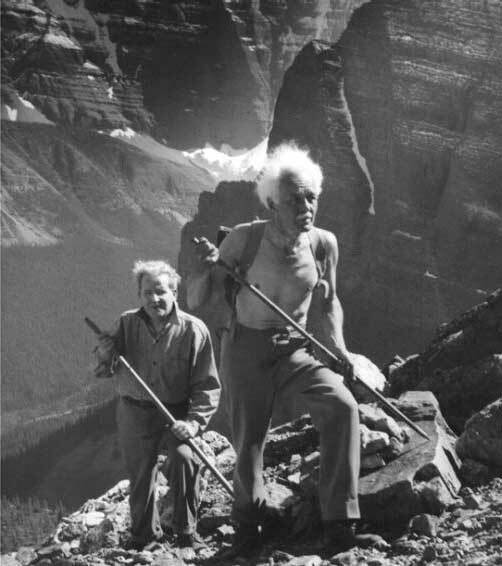 Esoterica: An excellent book that describes and illustrates his thought and methodology is A Hikers Guide to the Rocky Mountain Art of Lawren Harris, by Lisa Christensen. This letter was originally published as “Two spirits” on July 23, 2002. Plus ça change … The “visible nature” quotation shows Harris to have been a loyal Platonist. Olga, the wonderful Russian woman who helped my mother with housework, also worked for Harris. He gave Olga one of his sketches, which she promptly lost or destroyed. She thought his paintings were very unpleasant! It’s lucky that others, including Emily Carr, valued them more highly. When I was a child, lithographs of the Group of Seven decorated the walls of the Bank of Montreal. I grew up identifying the Group with the Canadian Shield; only later did I come across their work in the Rockies and in Quebec. I love his images and was fortunate to see the beautiful exhibit in the Vancouver Art Gallery two years ago of ALL the group of Seven and they included women not previously thought of as being a part of the group. It wasn’t until I moved to Canada from the USA that I really got to see their art and appreciate the richness in this great country. All artists abstract. It’s what we do when we set aboutcreating. It takes someone as daring as Lawrence Harris to show us just how far we can go with that concept and still hold the essence aloft. Harris’ work is going through a resurgence of interest right now, but the freshness of his images tell us that he has captured Canada’s natural world in a way which goes directly to the heart of everyone who sees his work. It’s great to be inspired by these archived emails. Thanks to you, Sarah for keeping it alive. His work has a lot in common with Nicholas Roerich, the Russian painter and mystic. Yes I just looked the Russian painter up. I do agree Chad. yes..I love “Isolation Mountain” it is onomotopeoia…the title echoes the perfect balance of subject/painting process speaks with style and drama. yes. Two spirits is so right – and half of what I read is to keep balance of these – one can get hung up in process and lose the soul of the subject, or lose sight of some key element of process. Soan, Hazel (2014-01-09). 10-Minute Watercolours (Collins Gem) (Kindle Locations 850-851). HarperCollins Publishers. Kindle Edition. As a painter and a Theosophist, the alchemical union of spirit and matter in the creation of art becomes a Devine or darmic quest. The inner recognition of this profound duality is felt so deeply within the heart and as a humbling attempt is made to portray this on canvas, one is constantly drawn into a balancing act between form and that within which makes it real. To honor That as the basis of all form and to be able to somehow tap into and walk the bridge that connects the two, is to me the great mystical union we crave not only as artist but as humans. 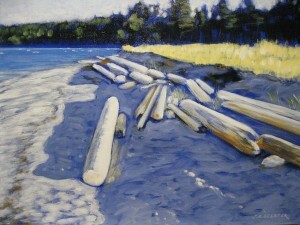 The late afternoon sun on the tip of Savary Island's Indian Point highlights the design elements of the logs and the summer surroundings of the island. 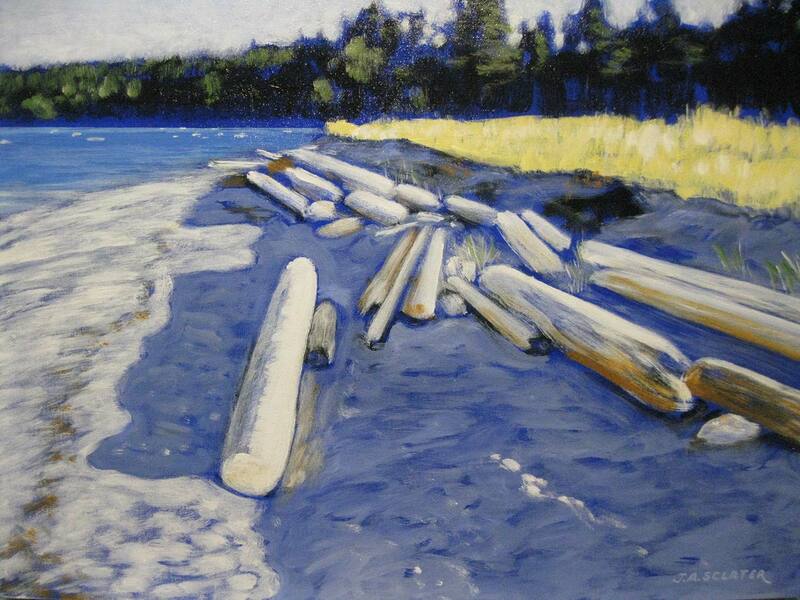 My enjoyment in representing the beauty of our world with strong design and bold colours is what drives my passion for my landscape painting of Savary Island and other parts of our amazing planet.